The "father" of Anglo-Jewish Reform; born in London Nov. 22, 1811; educated at the Jews' Free School, London. 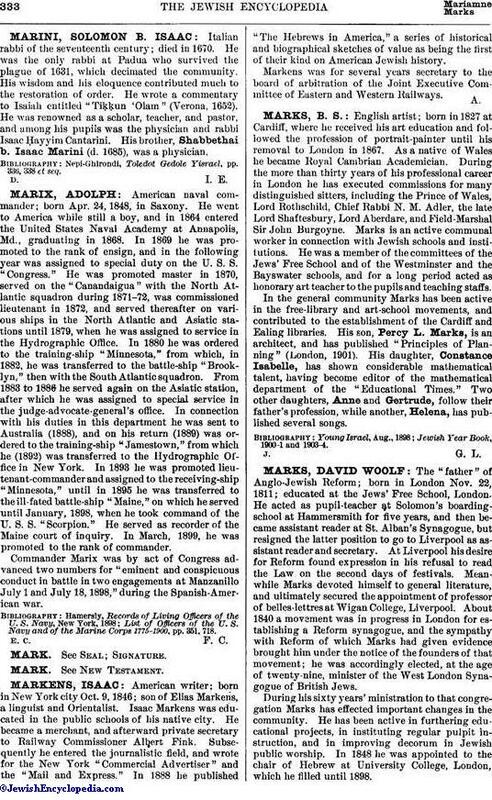 He acted as pupil-teacher at Solomon's boarding-school at Hammersmith for five years, and then became assistant reader at St. Alban's Synagogue, but resigned the latter position to go to Liverpool as assistant reader and secretary. At Liverpool his desire for Reform found expression in his refusal to read the Law on the second days of festivals. Meanwhile Marks devoted himself to general literature, and ultimately secured the appointment of professor of belles-lettres at Wigan College, Liverpool. About 1840 a movement was in progress in London for establishing a Reform synagogue, and the sympathy with Reform of which Marks had given evidence brought him under the notice of the founders of that movement; he was accordingly elected, at the age of twenty-nine, minister of the West London Synagogue of British Jews. During his sixty years' ministration to that congregation Marks has effected important changes in the community. He has been active in furthering educational projects, in instituting regular pulpit instruction, and in improving decorum in Jewish public worship. In 1848 he was appointed to the chair of Hebrew at University College, London, which he filled until 1898. 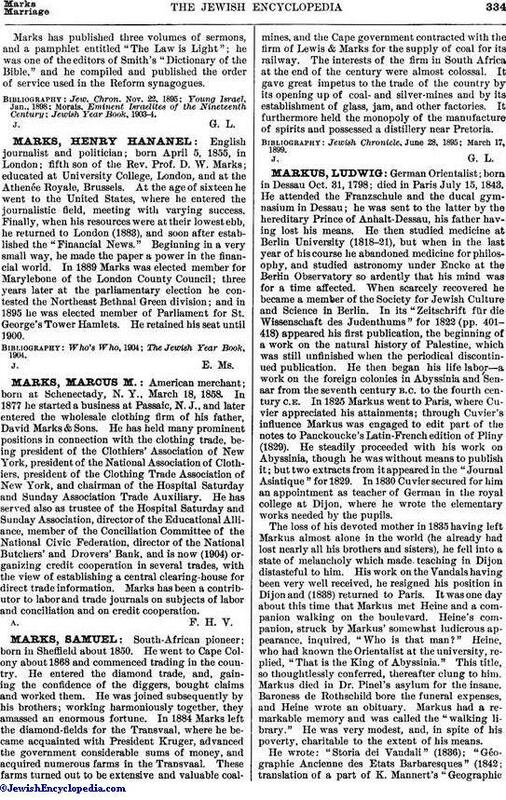 Marks has published three volumes of sermons, and a pamphlet entitled "The Law is Light"; he was one of the editors of Smith's "Dictionary of the Bible," and he compiled and published the order of service used in the Reform synagogues.